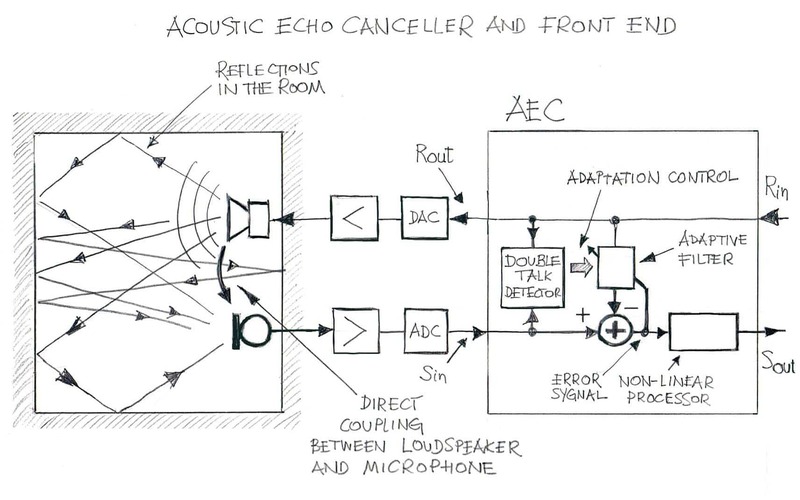 The Acoustic Echo Canceller is designed for removing/suppressing acoustic reflections, whereas line/network echo cancellers primarily address echo signals produced by reflections from hybrid circuits (or transformers) converting 4-wire interface into 2-wire interface in POTS/PSTN systems. Due to nonlinear behavior of the loudspeaker, the relationship between the acoustic pressure produced by the loudspeaker and the electrical signal driving it is not exactly linear; therefore, an adaptive filter that, in most designs, is a linear component, cannot adequately model the echo path. As a result, more stringent requirements are imposed onto the NLP so any audible traces of residual echoes are removed. The above mentioned characteristics of echoes require acoustic echo cancellers be equipped with more advanced adaptive filters, double talk detectors and nonlinear processors than their line/network echo canceller counterparts. For example, the adaptive filters used in Acoustic Echo Cancellers have to cover well the anticipated echo span, thus their lengths, in milliseconds, have to be at least as long as the echo span; VOCAL Acoustic Echo Canceller’s echo span coverage is configurable and can reach up to 256 milliseconds. In custom designs, the echo span coverage can be made longer than 256 milliseconds, if requested by Customer. Acoustic Echo Cancellers are expected to address (cancel/suppress) echoes of large energy comparable or exceeding the equivalent energy of the incoming signals. Such conditions pose challenging requirements for double-talk detectors; an advanced VOCAL Acoustic Echo Canceller’s double-talk detector performs well in conditions where ERL > -6dB. Adaptive filters of Acoustic Echo Cancellers have to react rapidly to echo path changes; VOCAL Acoustic Echo Canceller incorporates a subband adaptive filter whose adaptation speed is superior when compared with competitive solutions while its adaptation depth is more than adequate. VOCAL’s Acoustic Echo Canceller incorporates an advanced NLP which adequately removes traces of residual echoes. Since signal gains are controllable by the end user (by adjusting volume knobs for the loudspeaker or for the microphone, and that affects the total system loop gain), Acoustic Echo Cancellers, being a part of the closed-loop system, can be potentially exposed to system instability, which, if not controllable, may manifest by producing a howling effect. VOCAL’s Acoustic Echo Canceller is equipped with an anti-howling feature that minimizes the howling effect. In general, acoustic echo canceller performance requirements are driven by “industry standards” and customer requirements. In the area of telephony applications, there is ITU-T G.167 standard (a.k.a. Recommendations) that outlines specific performance requirements. However, the standard has become defunct. Thus, formally, it is no longer considered as being normative and governing the AEC product performance. Yet, it is still being frequently quoted and referenced. Other applicable standards include ITU-T G.160, ITU-T P.340, 3GPP, IEEE and other related documents. It is worth mentioning that a G.167-compliant AEC does not necessarily meet ITU-T G.168 standard, despite the fact that requirements related to adaptation speed and echo path coverage for AEC are more demanding for AEC than for LEC/NEC.